© Varahram et al. ; Licensee Bentham Open. Isoniazid (INH) is one of the most potent anti-tuberculosis (TB) drugs. The spread and transmission of INH- resistant bacilli are likely to pose a significant problem for National TB control Program (NTP). In this study, we aimed to determine the trend of INH-monoresistant TB in Iran. The susceptibility patterns of Mycobacterium tuberculosis (MTB) strains that were isolated from clinical samples were retrospectively analyzed (January 2003-December 2011). Identification and drug susceptibility testing (DST) were performed using both conventional and molecular methods. The associated risk factors were assessed using the Chi-square test. Out of 4825 culture-positive isolates, 6.1% were resistant to INH, with an increasing trend over the study period. The INH-monoresistance from 4.4 in 2003 reached to 9.4% in 2011. Among the studied risk factors, age was significantly associated with INH-monoresistance (p < 0.05). The increased trend in INH-monoresistance underlines the need for greater enforcement of national TB control programs. In this regard, better management of TB cases, establishing advanced diagnostic facilities and use of standard treatment regimens are recommended to avoid further emergence of INH resistant cases. Keywords: Drug resistance, isoniazid, Iran, Mycobacterium tuberculosis.. Tuberculosis (TB) is considered as one of the most common infectious diseases in Iran. According to the World Health Organization (WHO), the incidence rate of TB in Iran was 21 cases per 100,000 people in the year 2012 . Some important challenges for TB control strategies include the increasing prevalence and rapid distribution of drug-resistant TB. Recently, this concern has been further intensified by reports of extensively drug resistant (XDR) - and totally drug resistant-TB (TDR-TB) [2-5]. Although resistance to first and second line drugs poses the important risk to patients, resistance to isoniazid (INH) alone is also important. INH is the most potent anti-TB drug and is the main part of any first-line treatment regimen for TB . Additionally, based on National Tuberculosis Control Program (NTP) in Iran, INH is the basis of treatment for latent TB infection. Loss of therapeutic efficacy of this important anti-TB drug has considerable implications for control strategies and potential for patients . Treatment of patients infected with INH-monoresistant Mycobacterium tuberculosis (MTB) strains using standardized chemotherapy has been associated with increased risk of treatment failure and further acquired resistance, including new multidrug resistant-TB (MDR-TB) [8, 9]. Given the emergent role of INH in treatment strategies for TB cases, measuring the burden of INH resistant TB is regarded as one of the most important aspects of NTP. Till now, a few studies have documented INH-monoresistant TB in Iran. However, the exact magnitude of INH-monoresistant TB and associated risk factors is not well known in most parts of the country. Therefore, the present study was designed to provide the detailed pattern of INH-monores-istance trends in Iran and to determine risk factors associated with this kind of resistance. This retrospective study was performed at the Mycobacteriology Research Centre (MRC). MRC is the part of National Research Institute of Tuberculosis and Lung Disease (NRITLD) and the only national reference TB laboratory of Iran which is supervised by Swedish Institute for Infectious Disease Control. In addition, MRC cooperates with Ministry of Health and Medical Education in order to improve the patient treatment. The study was approved by the ethics committee of MRC. The classical information i.e., age, gender, nationality, place of birth and drug susceptibility testing (DST) patterns for each patient that was referred to MRC from January 2003 to December 2011was retrospectively analyzed. Clinical samples were first decontaminated by Petroff’s method and the sediments were inoculated into Lowenstein-Jensen (LJ) media . Bacterial isolates were identified as MTB complex using molecular methods, including spoligotyping and heat shock protein analysis as described elsewhere [11, 12]. Over the study period, laboratory used two different methods for DST. From 2003 to 2008, DST of isolates to first-line anti-TB drugs was determined by the proportion method . Resistance was expressed as the percentage of colonies that grew on critical concentrations of the drugs: 0.2µg/ml for INH, 2.0µg/ml for ethambutol, 4µg/ml for streptomycin and 40µg/ml for rifampicin. With advances in molecular technologies, the center adapted Multiplex Allele-Specific PCR for rapid screening of drug resistant strains (2009 to 2011) . The identified strains with INH resistance showed in vitro resistance to INH using both proportional and molecular methods. Statistical analysis was carried out using SPSS version 18 (SPSS Inc., Chicago, IL, USA). Associations of variable (age group, gender, nationality, place of residency) with the INH-monoresistance were assessed using Chi-square test. The Chi-square test was also used to evaluate the resistance trend by year of the report. p values less than 0.05 were considered statistically significant. 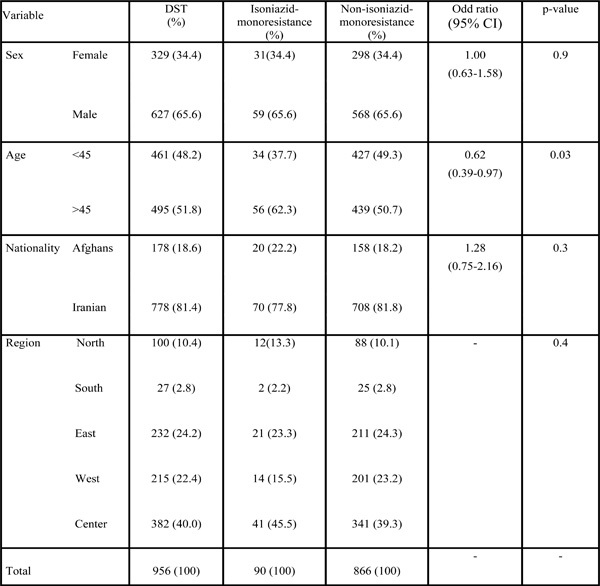 During the study period, a total of 4825 clinical isolates of TB were collected from different parts of Iran, of which 956 (19.8%) had complete demographic characteristics for analysis (Table 1). The mean age of study populations was 47.8 ±19.6 years. The male to female ratio was 65.6/34.4%. Among investigated cases, 81.4% were Iranian and 18.6% were Afghans. Based on patient clinical records, all 956 cases had previous history of treatment including those with incomplete treatment or treatment failure. Demographic characterization of study populations in different parts of Iran. Association of patient characteristics with isoniazid-monoresistance. As shown in the Fig. (1), despite periodic alteration, the rate of INH-monoresistant TB considerably increased from 2003(4.4%) to 2011(9.4%). In overall, during the last 9 years the trend of INH-monoresistance showed significant increase (p <0.001). During this time, of 4825 isolates for which DST was performed, 296 isolates (6.1%) were resistant to INH (Clinical and classical information were available for 90 INH-monoresistant cases). Isoniazid-monoresistant TB in Iran, 2003 to 2011. Classical analyses of 90 INH-monoresistant patients are shown in Table 2. The highest proportions of INH-monoresistant cases (62.3%) occurred in age above 45 years (p = 0.03). Geographically, most of the INH-monoresistant cases were from the central of Iran (45.5%) as compared to east (23.3%), west (15.5%), north (13.3%) and south (2.2%), respectively. However, the region of residency was not significantly associated with INH-monoresistance (P = 0.9). Similarly, the gender of patients and nationality showed insignificant association (p > 0.05). After a hundred years of discovery of the tubercle bacilli, TB still remains one of the most challenging issues in global health. According to the latest report released by WHO, there were an estimated 8.6 million new cases of TB and 1.3 million TB-related deaths worldwide . An important challenge for TB control is the emergence of strains that are resistant to the most potent anti-TB agents i.e. INH . Resistance to INH is frequently associated with increased risk of treatment failures and acquiring new drug resistance. Therefore, measuring the burden of TB cases with resistance to INH is regarded as one of the most important aspects of NTP in Iran. In this study, the overall rate of resistance to INH was 6.1%, with an increasing trend over the study period (Fig. 1). This rate of INH mono-resistant cases was higher than those of previous studies from Iran. During 2000–2003, Shamaei and others reported that 2.4% of TB isolates analyzed at NRITLD were resistant to INH . Likewise, subsequent investigation observed nearly the same percentages: 2.6 and 3.6% for new TB cases and previously treated patients, respectively . Our study also revealed high rates of INH-monoresistant TB compared with studies reported by neighboring countries i.e. Turkey . According to WHO, Iran has a lowest incidence of TB (21 per 100000 populations) among its all neighbors, which revealed effective implementation of Directly Observed Treatment Short-course (DOTS) strategies . However, the increasing rates of resistance to INH indicate the existence of a number of problems in management of drug resistant cases in the country. In this regard, based on national commitment protocols for improving TB control services, seven regional laboratories with DST capacity have been established in the country. But, these laboratories are still under quality control and do not have proper facilities for patients admission. Consequently, TB cases have to come to the central labora-tory for further treatment and hospitalization. Furthermore, most of the INH-monoresistant patients in Iran are treated with standardized short course chemotherapy, despite the fact that treatment in these cases requires minor modifi-cations as recommended by WHO . Our study also observed a significant increase in the rates of INH-monoresistant cases between 2009 and 2011 (Fig. 1). This observation could be explained by difference in the studied populations (previously treated cases) which are more likely to have drug resistant TB. Furthermore, high rate of INH-monoresistant cases in our study was seen in the center and eastern province of Iran i.e. Sistan-Baluchestan and Khorasan Razavi. These provinces are densely populated and seriously affected in terms of economy and public health status. Additionally, long borders (1500 km) with high-TB burden countries (Afghanistan and Pakistan), have made these provinces a natural route for TB transmission. In this respect, the existence of extended borders and immigrations has been suggested as important risk factors for increased prevalence of drug resistant-TB in these regions. Although, in the current survey, we did not find any significant association between drug resistant-TB and nationality, the risk of cross-bordering should be taken into consideration. Another notable finding in our study was association of drug resistant-TB and patients age. An analysis of drug-resistant-TB in United States, Germany and Pakistan identified younger age as an important risk factor for INH-resistant cases [20-22]. However, in the present study age above 45 years was significantly associated with INH-monoresistant-TB. This result could reflect the fact that previously treated cases with drug resistant TB occurred mainly among older people. An important limitation of this study was that the result cannot fully represent the prevalence of drug resistant TB in the Iran because the magnitude of drug resistance is not yet known in many areas of the country. In conclusion, we report an increasing trend in INH-monoresistant-TB in Iran. The increased trend underscores the need for greater enforcement of TB control programs. In this regard, better management of TB cases, establishing advanced diagnostic methods and use of standard treatment regimens are strongly recommended to avoid further emergence of INH resistant cases. The study was supported by National Research Institute of Tuberculosis and Lung Disease-Tehran-Iran. World Health Organization (WHO). Global Health Observatory Data Repository 2013 Available from: http://appswho int/ghodata 2013. Masjedi MR, Farnia P, Sorooch S , et al. Extensively drug-resistant tuberculosis: 2 years of surveillance in Iran. Clin Infect Dis 2006; 43: 841-7. Velayati AA, Masjedi MR, Farnia P , et al. Emergence of new forms of totally drug-resistant tuberculosis bacillisuper extensively drug-resistant tuberculosis or totally drug-resistant strains in Iran. Chest J 2009; 136: 420-5. Velayati AA, Farnia P, Masjedi MR. Totally drug-resistant tuberculosis (TDR-TB): A debate on global health communities. Int J Mycobacteriol 2013. Velayati AA, Farnia P, Masjedi MR. Letter to Editor The totally drug resistant tuberculosis (TDR-TB). Int J Clin Exp Med 2013; 6: 307-09. Wright A, Zignol M, Van Deun A , et al. Epidemiology of antituberculosis drug resistance 2002-07: an updated analysis of the global project on anti-tuberculosis drug resistance surveillance. Lancet 2009; 373: 1861-73. Rieder HL. Interventions for tuberculosis control and elimination international union against tuberculosis and lung disease paris. 2002. Falzon D, Jaramillo E, Schünemann H , et al. WHO guidelines for the programmatic management of drug-resistant tuberculosis: 2011 update. Eur Respir J 2011; 38: 516-28. Menzies D, Benedetti A, Paydar A , et al. Standardized treatment of active tuberculosis in patients with previous treatment and/or with mono-resistance to isoniazid: a systematic review and meta-analysis. PLoS Med 2009; 6: e1000150. Petroff S. A new and rapid method for the isolation and cultivation of tubercle bacilli directly from the sputum and feces. J Exp Med 1915; 21: 38-42. Kamerbeek J, Schouls L, Kolk A , et al. Simultaneous detection and strain differentiation of Mycobacterium tuberculosis for diagnosis and epidemiology. J Clin Microbiol 1997; 35: 907-14. Dvorska L, Bartos M, Martin G, Erler W, Pavlik I. Strategies for differentiation. identification and typing of medically important species of mycobacteria by molecular methods. Vet Med-Praha 2001; 46: 309-28. Rieder HL, Chonde TM, Myking H , et al. The public health service national tuberculosis reference laboratory and the national laboratory network minimum requirements role and operation in a low-income country. PrisFrance International Union against Tuberculosis and Lung Disease (IUATLD) 1998. Velayati AA, Farnia P, Mozafari M , et al. High prevelance of rifampin-monoresistant Tuberculosis: A retrospective analysis among iranian pulmonary tuberculosis patients. Am J Trop Med Hyg 2014; 90(1): 99-105. World Health Organization (WHO). Global tuberculosis report 2013. Sotgiu G, Centis R, D’Ambrosio L , et al. Do we need a new Fleming époque: The nightmare of drug-resistant tuberculosis. Int J Mycobacteriol 2013; 2: 123-25. Shamaei M, Marjani M, Chitsaz E , et al. First-line anti-tuberculosis drug resistance patterns and trends at the national TB referral center in Iran-eight years of surveillance. Int J Infect Dis 2009; 13: e236-40. Merza MA, Farnia P, Tabarsi P , et al. Anti-tuberculosis drug resistance and associated risk factors in a tertiary level TB center in Iran: a retrospective analysis. J Infect Dev Ctries 2011; 5: 511-19. Dispensary AT, Street I. Drug-resistant pulmonary tuberculosis in western Turkey: prevalence. clinical characteristics and treatment outcome. Ann Saudi Med 2005; 25: 313-18. Hoopes AJ, Kammerer JS, Harrington TA, Ijaz K, Armstrong LR. Isoniazid-monoresistant tuberculosis in the United States. 1993 to 2003. Arch Intern Med 2008; 168: 1984. Forssbohm M, Loddenkemper R, Rieder H. Isoniazid resistance among tuberculosis patients by birth cohort in Germany. Int J Tuberc Lung Dis 2003; 7: 973-. Hasan R, Jabeen K, Mehraj V , et al. Trends in Mycobacterium tuberculosis resistance Pakistan 1990-2007. Int J Infect Dis 2009; 13: e377-82.